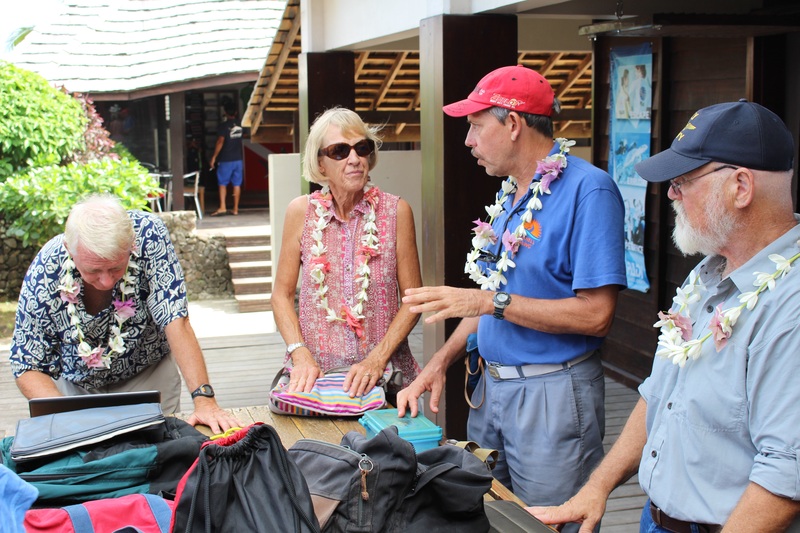 The next leg of the Blue Planet Odyssey is now underway as the boats leave Bora Bora after a prolonged cruise through French Polynesia and head off the beaten track to the Northern Cook Islands. Chapter Two and Tahawus were the first to leave on Sunday 31 May, with No Regrets and Maggie leaving on Tuesday 2 June. Joyful, Blue Wind and Coconut Woman will follow later. The delights of French Polynesia, and the challenges of a round the world voyage, have proved strong for some of the boats who made it this far, as Libby and Heron Reach made the difficult decision not to continue with the rally. They will spend some time cruising before heading back to the USA. Ransom will also stay longer in French Polynesia and plans to rejoin the BPO in Australia. The boats are keeping in daily email contact with each other as they make their individual routes across the vast Pacific. A fleet rendezvous is planned in Vava’u, Tonga, later this month. Here are some extracts from updates and boat blogs. As we pass through the channel out into the open ocean it occurs to me that Chapter Two was the last boat to arrive on Monday of this week and now we are the first boat to leave the anchorage for the next leg of our adventure. Tahawus falls into line behind us as we’ve decided we should sail together and look after each other. The few remaining BPO boats have been given the option to plan our own route with a rendezvous in Vava’u in June and a formal rendezvous in Vanuatu in August. The plan is to sail 700 miles to an island called Palmerston where we’ve been given special permission to clear customs and immigration. Technically, you should clear in at specific Cook Islands but because we are offering eye testing for children, we asked for an exception to this rule and it has been granted. We settle into our 4 hour shifts for the night with a full moon high on the horizon. These are my favorite passages where the skies are bright enough to see the horizon and the seas are calm. After leaving Bora Bora and motoring to make a noon high tide entrance at Maupihaa we decided to give it a pass and go on to Palmerston. Oh well. 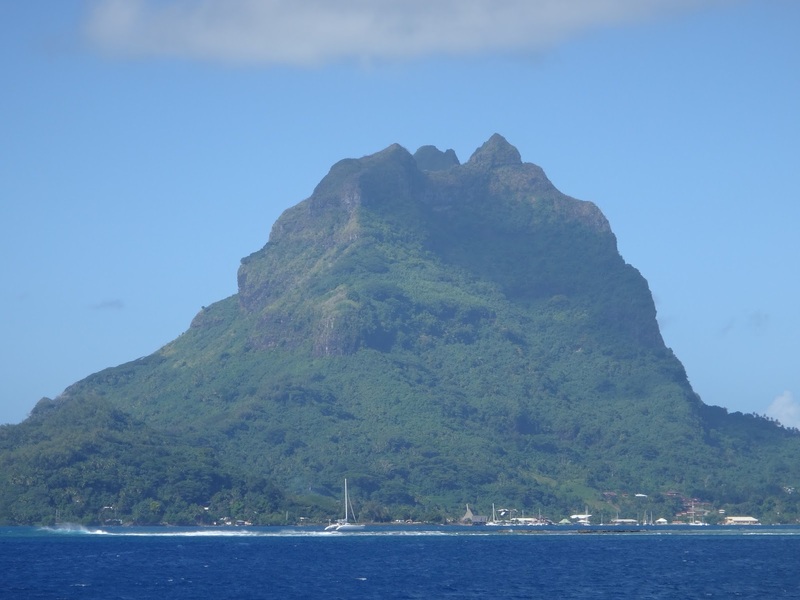 We sailed to Maupihaa with Tahawus overnight from Bora Bora, got to the pass at noon for slack tide, but the pass looked too rough, too narrow, and too shallow to enter safely. The guide books did warn us that this is the trickiest pass in all of Fr Polynesia. So we are sailing on to Palmerston in lighter than forecast winds. Had 4 squalls last night with rain and winds of 20 – 25 knots. Guess this mega El Nino has squashed the trade winds because they are not out here. Leis given as farewell, a final chat with Luc the BPO rep about the route to take. Photo: No Regrets. Heading North trying to keep speed above 3 knots in 5-7 knots of wind. Will be a long trip to Suwarrow! Left too late for a try at Maupiti today, so we’re anchored in the lagoon of Bora Bora and plan to try Maupiti tomorrow. It has been a slow sail to Palmerston, some nice wind last night other then that near drifter conditions with a very high amount of motoring. Sea state has not been kind either, even if we get a little wind it is difficult to keep wind in the sails. One of our slowest passages. In Maupiti. A bit of an adrenaline rush coming through the pass, but current was only 2.5 knots against us at noon, and nothing particularly difficult. We are the only yacht here. It is clearly a world apart from Bora Bora. Friendly people; not much here but awesome landscape; no WDG Internet; a bakery that might have croissant in the morning; a path up the mountain. There are 3 moorings near the red roofed church, but we’re happily anchored in 20 feet, sand bottom. Not our best point of sail in light winds, using Amel two pole system, 145 miles to Palmerston, with luck late tomorrow evening. Already assigned our host family, looking forward to meeting them. Very nice slow sail today and last night with Parasailor up getting 5 – 6 knots in 8 – 10 knots of wind. Seas are calm and the ride is good. Palmerston officials have agreed to allow us to examine all the school children’s eyes on Friday in support of the HIT foundation. Over email they have offered a classroom to use for as long as we need it. Hopefully we make it by Friday. Good sailing today, although not exactly in the direction we want to head! Lots of dolphins following the boat today – small ones with white mouths. Have the fishing line in the water, however no strikes, fish or birds! Left Maupiti this morning, after Bob climbed to the top of the mountain. No problem exiting the pass at 10am. Bob also pulled dinner from the sea. Just finished filleting a 8 to 10 pound tuna which we caught at about 3:30PM. Perfect time to allow time to fillet it and have it fresh for supper. This morning I was up before dawn and at 6:45 was on my way to climb the mountain at Maupiti. A 15 minute walk along the road and then it took me 1 hour to reach the top. The views on route were spectacular and once on top they were breath-taking. I was back at the dock an hour after reaching the top after getting off the path by mistake on the way down and having to bush wack for a while to find the path. I had company on the trip. A dog came up the mountain with me and kept me company. I met a couple coming up about 10 minutes from the bottom. The lady was giving the dog lots of scratches and I never saw the dog again so I’m sure he went up for a second time with them. Zeke and Bill were just about to leave the dock when I arrived at the dock at 9:05. We got the dinghy lifted, took the motor off and were ready to leave by 10. The winds were light but have picked up to 12 to 13 knots and we are sailing along at 7 knots. The skies are blue with a few billowy clouds. The boat is not rocking too much and we are all looking forward to a tasty fresh tuna dinner. It is now officially June and I’m wondering, where did the time go? It has definitely been an interesting journey for the three of us and one of the hardest things that I’ve ever done. I’ve learned that I can be fearless in the face of adversity, be tough with dealing with crew, have strength when reeling with seasickness, to always have respect for the ocean, and that each day is different depending on the winds and seas. Our time together as a family has kept us very close knit because we depend on each for survival. When we started our journey, I wasn’t sure what was in store for us but this experience has enriched our lives tremendously. It’s humbling to sail to remote islands and meet villagers who are extremely happy with their traditions, culture and status quo. They are always eager to share what little fruits or vegetables are available on their tiny slice of an island. It definitely keeps everything in perspective. Currently, we have sailed over 700 miles from our last rendezvous in Bora Bora and one day away from Palmerston in the Cook Islands. It is an island that was founded by a gentlemen named William Marsters in 1862. He had three wives and proceeded to build each one a house on the island and populate with children. There are approximately 100 people living on the island with most of them a direct descendent of Mr. Marsters. We have notified the officials that we will make landfall by Thursday evening and will need assistance with anchoring. They have rolled out the welcome mat and are awaiting our arrival. We’ve been assigned a host family by the name of Marsters and they will make sure that we are welcomed onto the island. 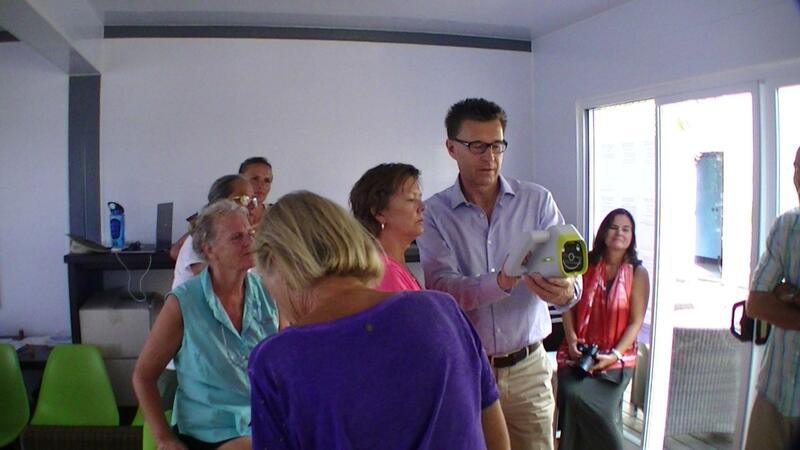 I’ve already arranged with our contact to conduct eye testing on the local school children. It should prove to be an enriching experience for all of us. This passage has started out as our slowest to date. With light winds we sailed where we could which was northwest towards China. At least we are getting a lot read about upcoming places. We also spend a lot of time sleeping to make up for the nights awake. We have just heard that this is now an El Nino year, the strongest in 120 years. It doesn’t usually start this late. One of the effects is lighter and more variable tradewinds. Another is drought in India which has already begun. The rain carrying southwest monsoon is late arriving. We will have to be careful to get regular weather updates. Our destination this trip is the tiny atoll of Suwarrow in the Cook Islands. It is a National Park with only a warden living there and we had to write for permission to stop. It is one of the endangered islands of the South Pacific due to rising water levels so wanted to talk to the warden about that. We hope the conditions will be ok for getting through the pass and anchoring inside. There is a good swell and wind from the south coming from a winter storm in NZ this week. We have approximately 200 NM to reach Suwarrow which we expect will be first thing on Sunday morning. Good sail today, of course not exactly in the direction we wanted, however closer. Two other Danish yachts in the anchorage at Palmerston. The local officials are excited about having their children’s eyes examined. The islanders and their administrators were extremely appreciative and noted that nobody had ever checked the children’s eyes before, we will finish the exams on Monday. We must just send confirmation to the Ministry of Health that the examiners have been trained and are competent to do the exams.